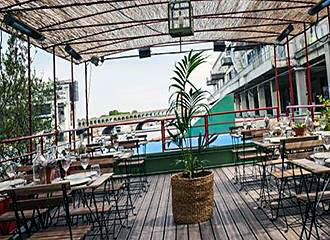 Playtime is one of the newer entertainment venues located on a barge permanently moored on the River Seine and includes a restaurant, bar, a deck terrace with swimming pool and a nightclub downstairs. Only opened just before the summer of 2014, Le Playtime is a barge on the River Seine that has been transformed into a restaurant, a bar and a nightclub, and is a unique venue that has a lovely setting looking over towards the modern ministry of finance building that juts out into the river. 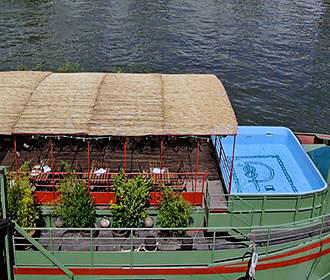 Yet it also has one very unique aspect to it, and that is the fact that there is a small swimming pool at one end of the barge on the deck terrace, which is an ideal place to cool down, and if you remember your swimming outfit you can have a proper dip. Plus with its relaxed atmosphere you do not have to abide by the strict rules of swimming caps and no Bermuda shorts like you find are generally the rules in swimming pools in Paris. When it comes to the restaurant side of things, there is tapas selection available or you could opt for a salad. But there are also a few starters and desserts including a very popular cheesecake if you wish to opt for more of a three course meal. The main courses at Le Playtime floating restaurant in Paris are mainly grillades, which are grilled main courses and consist mostly of brochette options, which are basically skewers, normally of meat that has been marinated, such as chicken tandoori style or pork marinated in caramel, but there is a vegetarian option and these can be accompanied by fries, etc. Now when it comes to downstairs in the barge of Le Playtime, there is a large screen TV that has been known to show the major French football matches. Although, with its ample sized dance floor and an area for live music or DJs, it turns into one of the floating nightclubs in Paris. So, with a relaxed atmosphere that matches its name, you can party the night away until the very early hours. 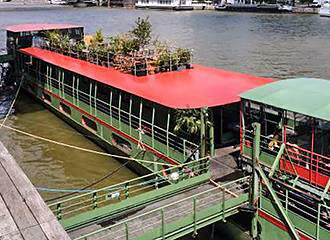 You have already gathered by now that this is a barge permanently moored on the River Seine and it is located at the Quai d’Austerlitz in the 13th Arrondissement of Paris very close to the cultural venue of Les Docks - Cite de la Mode et du Design. It is normally open on set days, but the opening times vary from around midday through to around 6pm, yet it also does not close until the early hours and sometimes as late as 4am for those of you who like to party until dawn. And when it comes to getting to Le Playtime, the Gare d’Austerlitz train station is the nearest place for the RER trains serving line C, and it is here that you will find a Metro station as well that serves lines 5 and 10. However, we would like to point out that the usual systems of public transport in Paris always stop during the early hours, and therefore you would need to make alternative arrangements to get back to your hotel or apartment if you are leaving near the closing time.